Musical instruments differ in compass, the variety of strength of a single note, accent value, survival value, the speed of articulation for a repeated note, and how many notes each instrument can play at once. As such, a variety of instruments were utilized by the Ancient Egyptians to provide a complete system/range of musical sounds. 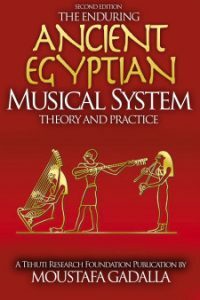 It should be noted that the overview of Ancient Egyptian musical instruments in this book is limited to instruments that can be compared with present-day instruments. 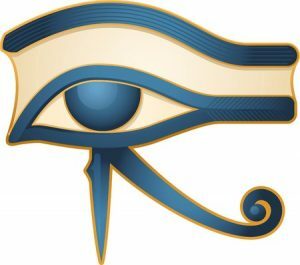 Some of the instruments of the Ancient Egyptians differ too much from the present day classification to be classed with any of them. Musical bands varied, in Ancient Egypt. Smaller and larger ensembles were employed for various purposes, as evident from musical scenes depicted in Ancient Egyptian buildings. It is sufficiently evident, from the sculptures of the Ancient Egyptians, that their musicians were acquainted with the triple symphony—the harmony of instruments, voices, and of voices and instruments. The playing of musical instruments was controlled by the conductors’ movements of hands (chironomids). Their hand signs show a variety of playing: unison, chord, polyphony, etc., as shown earlier. The chironomid presided over the musical ensemble and, by a range of gestures, determined the pitch and intervals on which the musicians based their performance. The details of this examination are reported in a special study [H. Hickmann, The Chironomy in Ancient Egypt, Magazine of Egyptian Language and the Antique 83, 2, 1958.]. 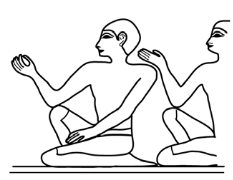 Symphonic and polyphonic variations are depicted in musical scenes of Ancient Egyptian buildings from the Old Kingdom (4500 years ago), with a director guiding the total ensemble by means of visible gestures. One or more chironomids were depicted to signify the type of performance. It must be noted that depicting more than one chironomid for one instrument is symbolic of the action intended in Ancient Egyptian artistic representation. 1. The chironomids are indicating identical hand signs; thus the musician(s) is/are playing in unison. a. 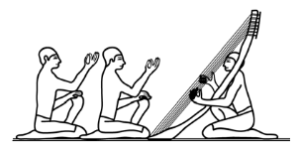 In the tomb of Ti [Saqqara, Old Kingdom], we have two illustrated chironomids giving different hand signals for a single instrument (harp), representing two different sounds; i.e. portraying an example of polyphony. This depiction of two chironomids is indicative of double tonality—which could be either consecutive or simultaneous. b. Playing a chord with three different tones is depicted [shown below] in Nencheftka’s tomb [5th Dynasty, Saqqara, now in Cairo Museum]. Three different hand signals are shown by the depicted chironomids. Another example of polyphony composed of three different tones is presented in a musical scene from a relief from the tomb of Nekauhor [Saqqara, 5th Dynasty, presently at the Metropolitan Museum of Art, New York].